Ingame when I start the song it checks the tuning as I supposed C-A-D-G, but afterwards not starting the 'highway' the game crashes. How can I correct all this? 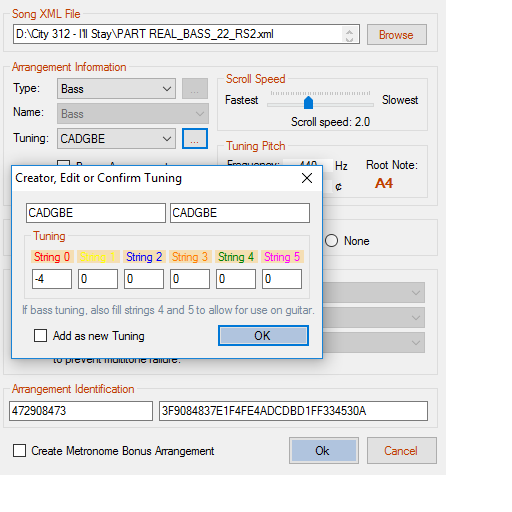 @DiversantBivnev the fact the song crash is likely unrelated to the toolkit question regarding strings 4 and 5 tuning. The toolkit warning is idiotic in your case as string 4 and 5 should be set to 0 in your case. As for the crash, hard to say just like that why it doesn't work but first make sure you are using the latest toolkit beta and the latest EOF version. @DiversantBivnev The toolkit warning is idiotic in your case as string 4 and 5 should be set to 0 in your case. In Toolkit v2.8.4.1-6463237b all the same. Also updated EOF, saved .XML files and tried to import. No success. Somehow I managed to make my CDLC work: I converted it to .gp5 using RocksmithToTab converter. Then imported it in EOF, saved it and imported XML with RocksmithToolkit. CDLC now works and tuning is C-A-D-G.
Share .psarc, .xml or which files? Ouch! A little harsh don't you think? 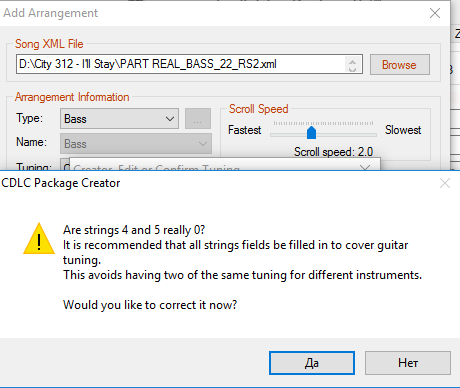 @cozy1 not really in that case, i can understand if any other strings weren't to 0 but you are in a case where it's just a drop tuning so there's no reason for the two highest to be of a different value than the 3 other strings that aren't drop. And this will fall under the "custom tuning" territory of RS anyway no matter what is indicated in the two highest strings so the warning don't actually bring anything at all in that specific case. @firekorn Really. No more milk and cookies for you.